« Jerry Lee Lewis – Happy Birthday From Metal Odyssey! 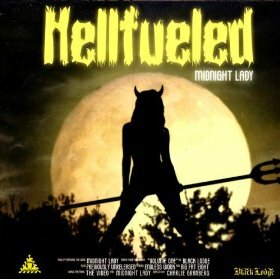 Hellfueled – Revisiting “Midnight Lady” EP From 2004! HELLFUELED – In Metal Odyssey’s quest, this Halloween Season, to deliver reviews on Metal, Hard Rock and Punk Bands that bestow horror-theme tendencies of sound, style and persona, here is the very first installment for this gloriously wicked and frightful October of 2010… Hellfueled. This is one very cool Metal Band from Husqvarna, Sweden, not because I said so, it’s due to the clear fact they can write and play songs that are memorable. Anytime a band’s particular song or sound sticks in my Metal brain, it tells me that band is damn good. Midnight Lady is one hell of a memorable song from one hell of a memorable band that is Hellfueled. Could it be a personal “gravitation” or “taste” in music happening here with Hellfueled? Probably. The only truth is, I would not go out of my way so often as I do, to just recommend pigeon crap on a platter. I try my hardest, to recommend the “coolest” bands and the creme’ de’ la creme’ of Metal, to my fellow Metalheads of the Metal Odyssey Battalion. Metal be thy name. The song Midnight Lady opens up with a riff that was born to grab my attention and this song never let’s up on it’s ’80’s Heavy Metal outer-glow. Midnight Lady just lifts off from the onset and never seems to land to the ground, which is what good Heavy Metal is supposed to do in the first place. Despite the resonance of some Old School Heavy Metal from days long past, Hellfueled delivered a very relevant song in 2004 with Midnight Lady and it still is relevant in 2010, when compared to what’s being released at the moment. Some may concur that Hellfueled isn’t playing anything that hasn’t been heard before. I counter by stating Hellfueled plays an European style of Traditional Heavy Metal and does so with a defiant level of confidence and talent. Just the three songs heard on this Midnight Lady EP, demonstrates the fire and hunger of a band, that trusts their style of sound and the path of heaviness they have chosen. Reflecting for just a moment, to a band that just might be an influence to Hellfueled… Black Sabbath. Andy Alkman, the lead vocalist for Hellfueled, sounds remarkably close to that of the everlasting and legendary… OZZY. Vocals are supposed to be a unique characteristic, yet sometimes close similarities can occur between different singers, that is reality. I could not be more honest, in stating that Andy’s vocals are tailor-made for this style and sound of Heavy Metal. His vocals come across as natural and unforced, with any resemblance to Ozzy Osbourne being unintentional. If Andy’s intent was to vocally sound like Ozzy, well, then he obviously nailed it. Believe me, this is not the first place where Andy’s vocals have been compared to Ozzy. The two previously unreleased demo songs, (Endless Work and Big Fat Eight), are very muscular in the Traditional Heavy Metal style, while not sounding as completely polished as Midnight Lady. Nonetheless, both of these demo songs can stand alone and take a pass on any further tweaking on the production side… the rawness brings out a more lean and mean aura to the vocals and overall sound of the band. The music video for Midnight Lady that comes as a bonus to this EP is fun to watch. A teenage/college age couple are taking a late night cruise when all of a sudden, they drive by the Hellfueled band hitchhiking on the side of a dark and desolate country road. The girl in the car looks at the band as they drive by them and makes a goofy facial gesture at them. Game on. Watch for yourself, as this couple finds out the hard way not to mess around with Hellfueled! Just click on the video box below! Hellfueled takes the Traditional Heavy Metal style and plays it in a manner where I feel surrounded by their sound. Very strong, loud and enveloping are Hellfueled as they play on these songs, vocals included, with a guitar driven force. For new fans, this Midnight Lady EP makes for a solid introduction to Hellfueled. I’ve seen the mp3 and CD/EP of Midnight Lady for sale on Amazon.com. It is worth picking up the entire CD/EP, as you are getting not only the two previously unreleased demo’s, your also getting the music video for Midnight Lady as well. This Midnight Lady EP is a terrific Metal listen and music video from Hellfueled that shouldn’t fly under your Metal radar. Plus… if you ever see Hellfueled hitching for a ride, don’t be foolish by not helping them out. * Midnight Lady EP was released in Sweden in December of 2004, on Black Lodge. * Midnight Lady EP had a worldwide release date in April of 2005, on Black Lodge. * Endless Work and Big Fat Eight are also listed as “Japanese Bonus Tracks” from Hellfueled’s debut album from 2004 – Volume One. (This info is listed on Hellfueled’s official website under “discography”. This entry was posted on October 2, 2010 at 1:25 pm and is filed under Hard Rock, hard rock albums, hard rock bands, hard rock music, Heavy Metal, heavy metal albums, heavy metal bands, heavy metal music, heavy metal videos, metal music, metal odyssey, Music, rock music, rock music news with tags hard rock music, Heavy Metal, heavy metal bands, heavy metal from sweden, heavy metal history, heavy metal music, hellfueled, hellfueled midnight lady CD single, metal music, metal odyssey, midnight lady ep, midnight lady music video, Music, old school heavy metal, rock music, traditional heavy metal. You can follow any responses to this entry through the RSS 2.0 feed. You can leave a response, or trackback from your own site.